Isabel Ching, Executive Director of Hamilton Madison House, joins the ranks as a major Lower East Side (LES) leader. She has already demonstrated strong determination to serve the LES community, from child care to senior care and high quality mental health services. Bruce Radler, CEO & Founder of Basketball City, is a champion because he has committed Basketball City to give free court time to many of Lower East Side's youth, including schools and local organizations - a valuable gesture given the lack of open space and public basketball court space not readily available. And he kept his promise to do so! Carol Lamberg, former Executive Director of Settlement Housing Fund, dedicated her life to finding and building affordable housing for all New Yorkers. It was her vision and determination that helped create the Two Bridges neighborhood, along with 1,500 units of affordable housing. Her work was hardly confined to the Lower East Side as evidenced by the thriving New Settlement community in the Bronx and other projects city-wide. Not attending and would like to still contribute? You can donate with or without purchasing a ticket, by entering a donation at the bottom of the RSVP page. Your firm/organization's Full Page Program Ad will be part of our keepsake Benefit Program, containing information about Two Bridges Neighborhood Council's impact in the community and our honorees. The Program will be distributed to those who made contributions and Benefit attendees. 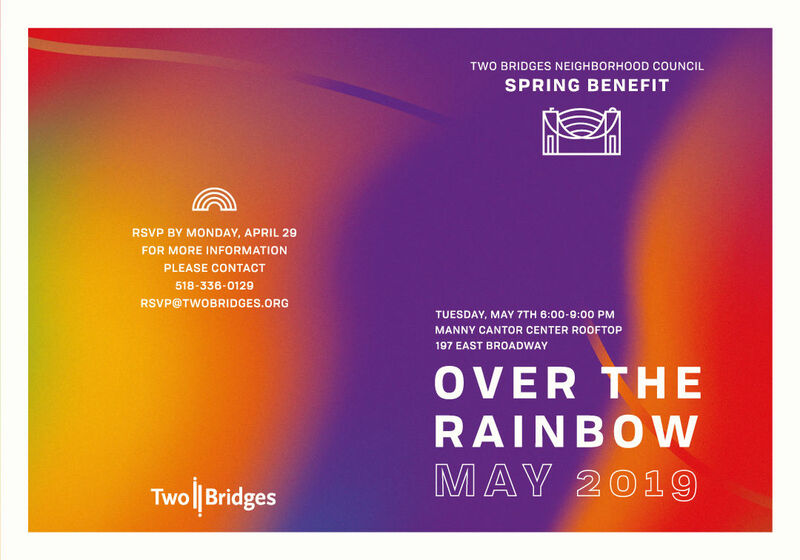 Your firm/organization's Half Page Program Ad will be part of our keepsake Benefit Program, containing information about Two Bridges Neighborhood Council's impact in the community and our honorees. The Program will be distributed to those who made contributions and Benefit attendees. TBNC has partnered with Give Lively to securely process your online donation. This transaction will appear on your credit card statement as "TBNC". This transaction is subject to Give Lively's Terms and Privacy.